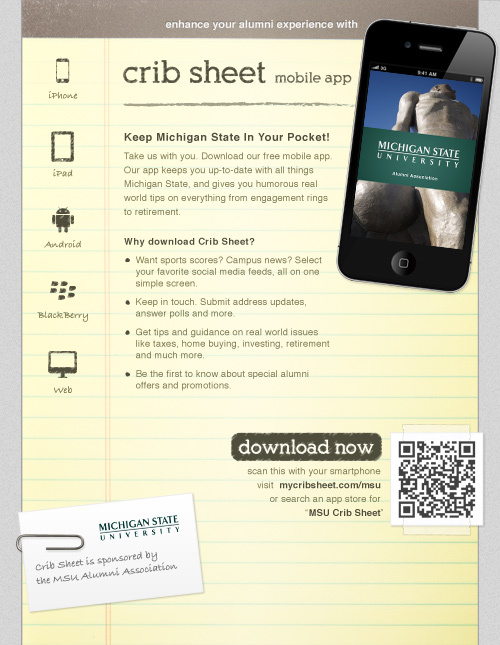 If you’d like to use this new design to help promote your Crib Sheet app, please let us know. We’ll also supply you with native Photoshop files. An app customer recently requested additional posts to help them promote their app. I hope everyone enjoys these ideas. This post is part of a series for our customers on easy ways to promote your app. 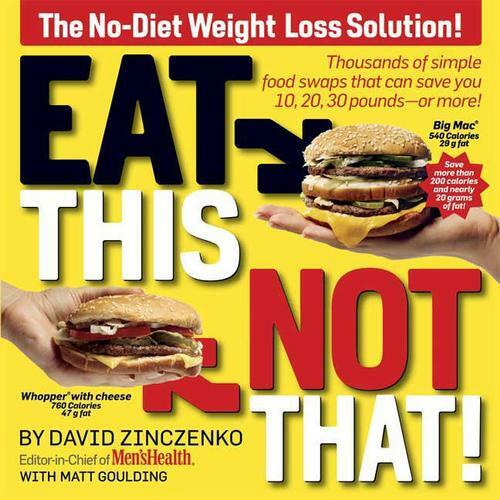 Have you ever read the “Eat This, Not That” books? They’re fun books that not only tell you what’s bad for you, but they give you a healthier alternative. I hope this post will give you similar “healthy” tips for promoting our app (or any app) via your social media and get you more downloads. 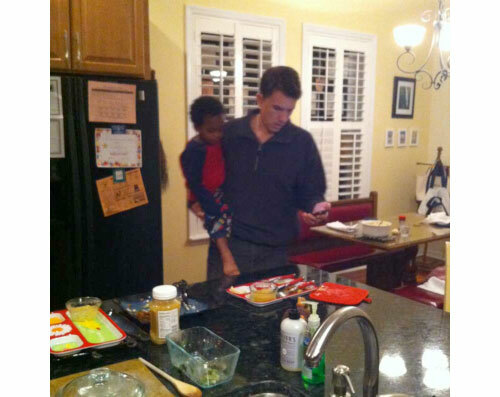 I’d like to caption the above photo: My husband reading e-mail while holding toddler and doing dishes. The truth is that your typical “mobile reader” is a multitasking alum with a short attention span and a tiny screen. The below tips will help get your typical mobile reader to quickly download your app. 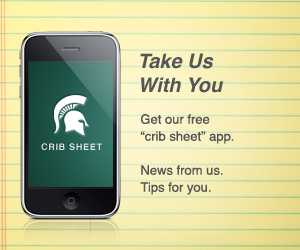 Link directly to the app (using our smart link, see Tip #2). If you send users to another page describing the app with more instructions for downloading the app, they’ll give up. Tip #2: Make your links tappable. If the “http://” prefix is in your link, it will usually be tappable (otherwise, it may just be text). In the above example, our smart link recognizes the reader’s device, and gets them to the right app store to download the app. Tip #3: Use your actual app name. 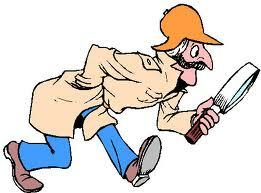 Some readers will search for your app in an app store. If you supply extra words, their search results might be empty. Tip #4: Give specific reasons to download the app. Tell them it’s FREE, available on iPhone, iPad, Android, BlackBerry, and any computer. It’s full of news from you and useful life tips. 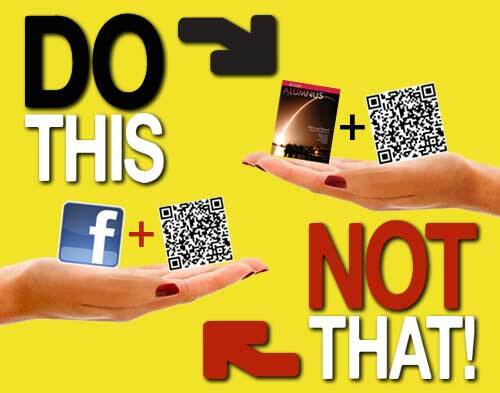 Tip #5: Don’t use QR codes in social media. QR codes are cool, but they’re best used in print ads. A QR code is scanned by a phone. If users read your post on their phones, they would need to set up a complicated set of mirrors to scan your QR code. 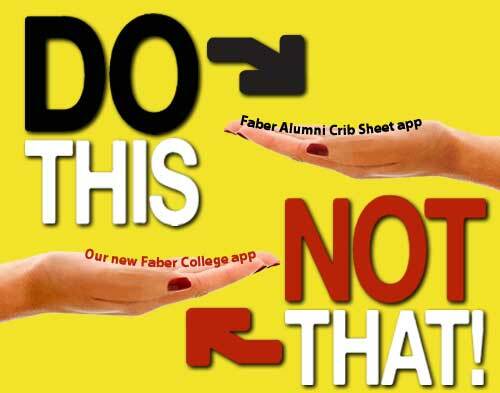 The “Faber Alumni Crib Sheet” is live! 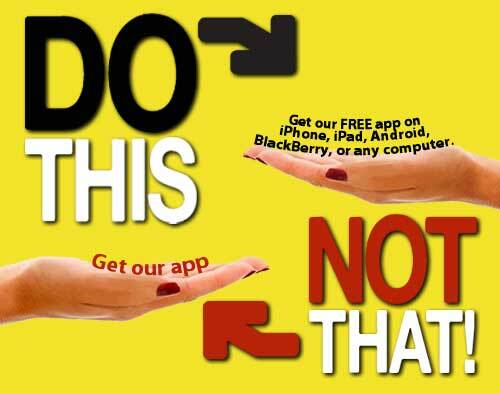 Search for our FREE app in any app store with timely news from us and humorous life 101 tips for you. 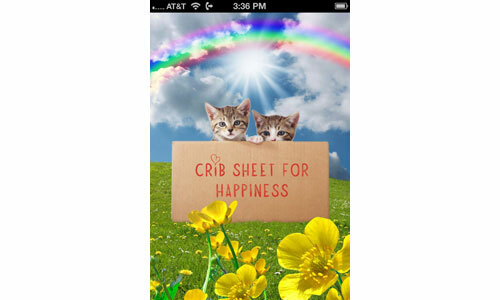 It’s available on iPhone, iPad, Android, BlackBerry, and any computer. Learn more at http://www.mycribsheet.com/faber. And if your creative juices are running low, we’ve got monthly post suggestions for you. Or, feel free to run a post by me at nicole@capandcompass.com. Searching for ways to promote your app? 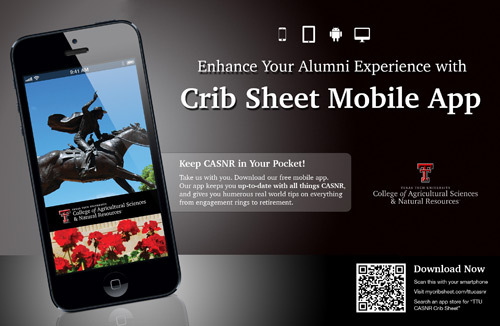 La Salle University recently used a wonderfully creative “scavenger hunt” to help promote their “crib sheet” app. Get La Salle young alumni to download and explore the app. Offer a drawing to win an iPad 2 to La Salle 2011 grads. 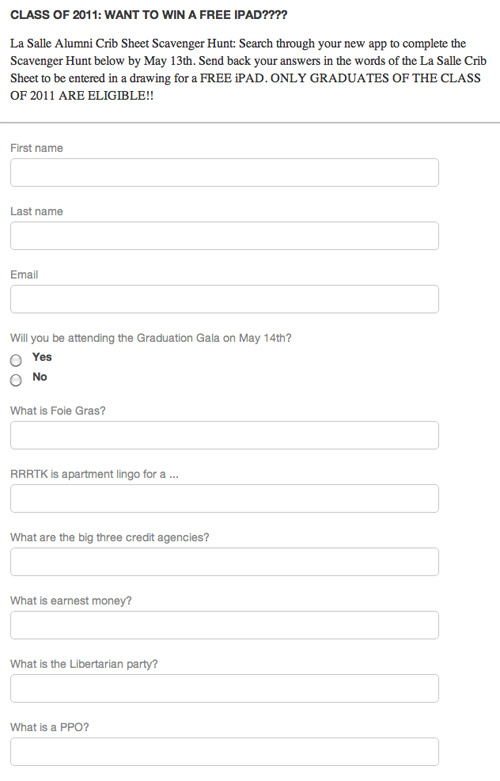 To enter, they needed to download the app and fill out a “scavenger hunt” form (on questions about our life skills topic content) prior to graduation. La Salle promoted the scavenger hunt with e-mail blasts, flyers around campus and advertising at Senior events. Students were instructed to download the app and look for the “Scavenger Hunt” feedback form in their news feed. This form asked users to read through various topics to find answers (and hopefully learn a bit on credit, home buying, and more along the way). La Salle had over 50 feedback form responses, but more importantly their downloads grew to roughly the size of their graduating class. 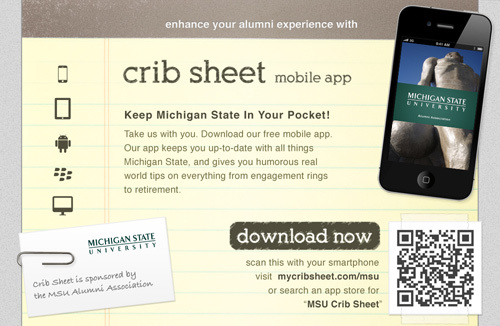 Use events like graduation and homecoming to rally your alumni/members around a creative incentive to get and use your app. If you don’t have the funds for a large prize, consider using smaller gift cards for local restaurants or tickets to an upcoming campus event. Keep your feedback form to 3-5 questions, so the incentive matches the work required. 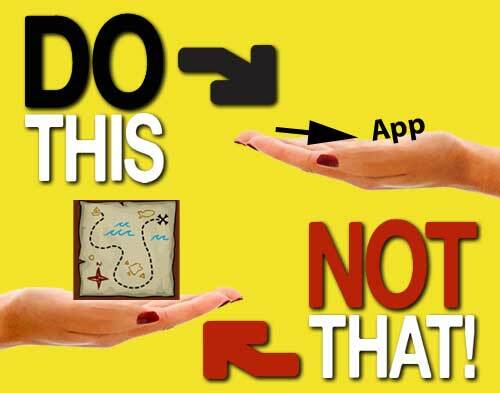 And most of all, like La Salle, keep those creative juices flowing on how to get the word out about your app! Some of the most successful products on the market today may not differ much from their competitors, except for that thing that’s hard to define: soul. Their brand isn’t about just ice cream. The company sends their ice cream waste to a pig farm, where the pigs run at the first sight of their truck. It’s my daughter’s dream to be reincarnated as one of those pigs. That’s soul. Many companies try to manufacture soul. Chain restaurants put local high school teams on their wall and adorn their servers with crazy pins. Right out of the starting gate, I wanted our products to have soul. Prior to writing our content, we surveyed other books and websites that tried to explain “life skills.” Generally speaking, they were just boring. On a business dinner, it’s always nice to extend your hand when you first meet (no fist bumps). A proper handshake involves eye contact and three-second, firm grip. That’s it. And don’t count to three out loud. Soul is that “special something” that often connects people to brands. 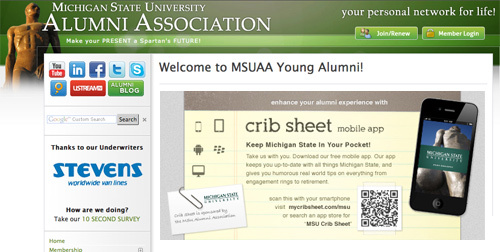 Our content has soul… which you can use to build your brand with alumni. 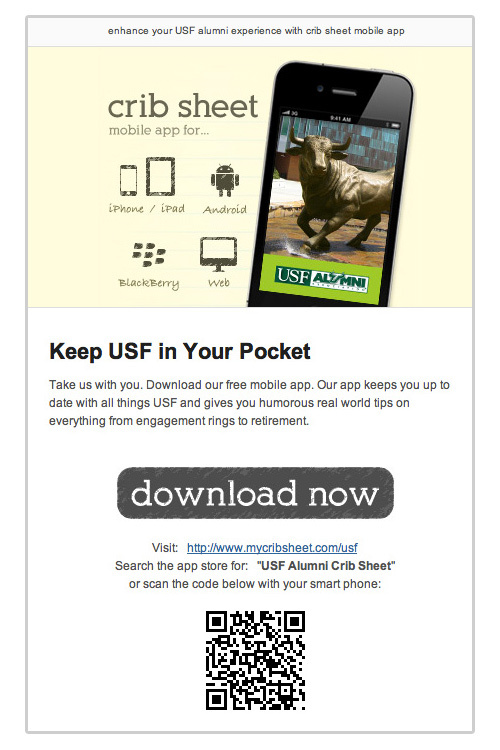 It’s a simple equation – the more you tell your alumni and members about your app, the more will download and use it. We’re seeing high download statistics from customers who make monthly posts via their existing social media about their app. Plus, this type of promotion is free. To make your job easy, we’ve put together sample posts for every month of the year (see below). Just copy, paste and substitute your institution’s name and smart link. Remember to include your “smart link” in your announcement – it recognizes the kind of device it is clicked on from, and directs your users to the easiest way to download. This post is part of a series on easy ways to get the word out about your app. 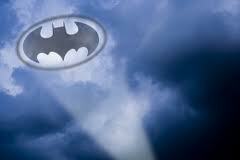 Want to send a strong signal out to your alumni or members about your app? Beyond projecting a large silhouetted shape of your logo across the cloudy sky, we have some more traditional ideas for you. As we review statistics and talk with our current app customers, one thing is clear: when the app is promoted, the app gets used (big surprise). We make it super easy to get the word out. Once your app is live, we’ll send you a our free, custom promotional package with print and online ads. First, you’ll see some common elements in most of these promotional pieces. The most important is your smart link. Try using this URL on your smartphone to see how it works. You’ll also see a QR code – this is simply a scannable version of your smart link. A smartphone user can see this code in a magazine ad or website ad, and scan it with their phone instead of typing the smart link address into their mobile browser. Use our template and/or include one of our on-line ads in your normal HTML email. Place a magazine ad, add a buckslip to a mailing, or distribute pocket guides. Include a 9″ x 4″ buckslip in your next mailing. 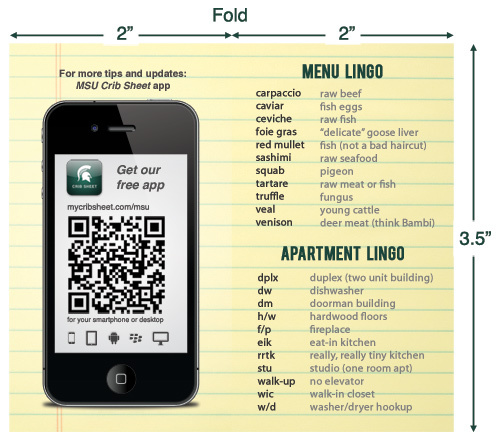 Give these popular, glossary cards at events. 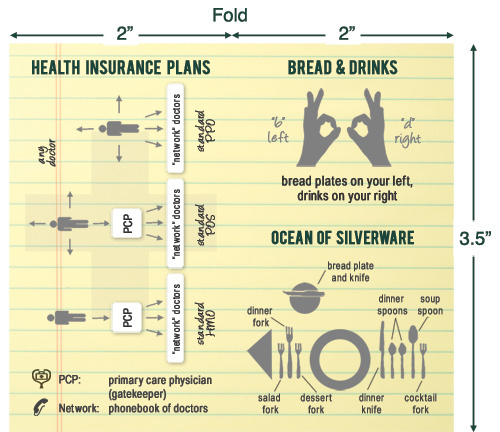 They fit perfectly in a wallet or pocket, and provide mini tips from our life skills topics. We provide you the native Photoshop files to make edits (and finished PDF files). If you decide to create your own designs, remember to include your smart link, QR code, and our basic language (these elements have proven effective in getting downloads). Our current customer statistics show that once a user downloads the app, they return to it again and again. Let us know what we can do to help by contacting Nicole at nicole@capandcompass.com.